Munich. 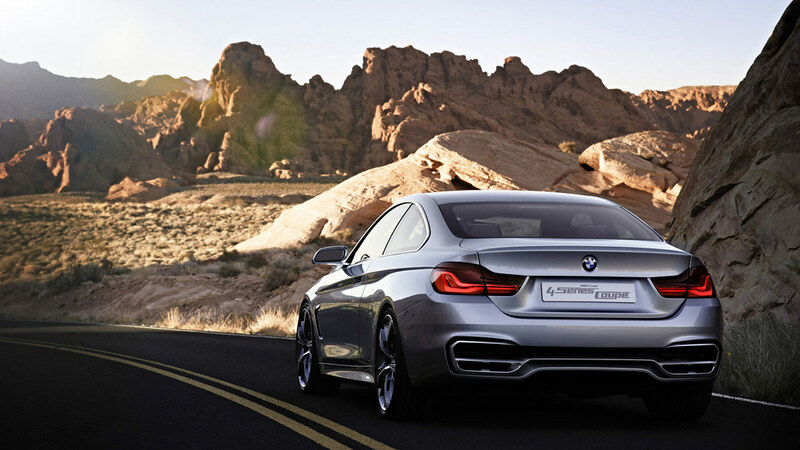 BMW presents the BMW Concept 4 Series Coupe. 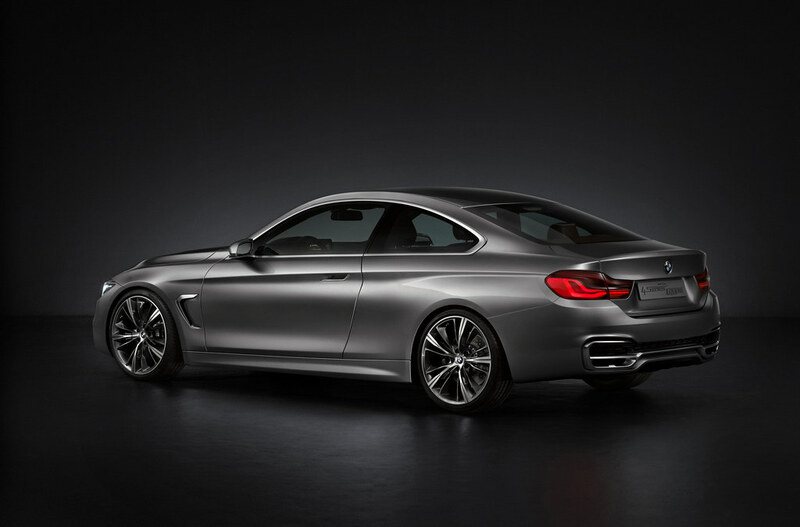 BMW 4 Series Coupe Concept . Aesthetics, dynamics, individuality. The “4″ – a sign of greater exclusivity and presence. 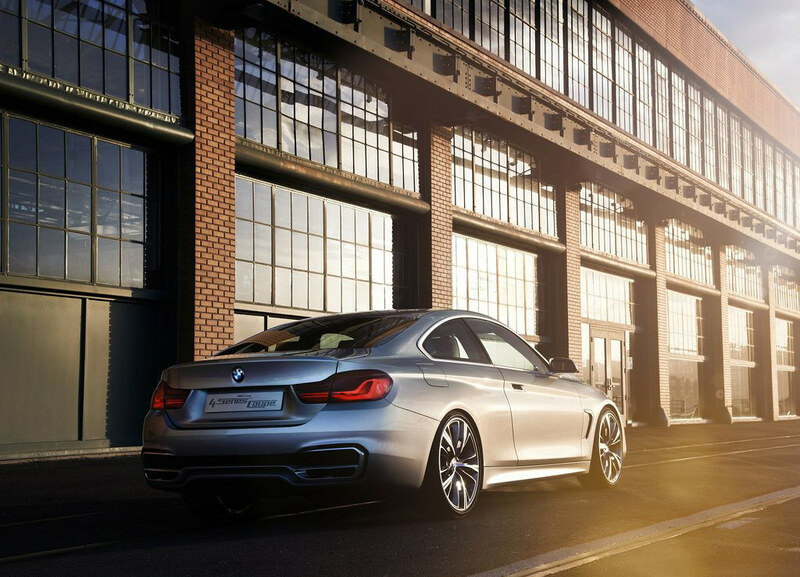 The BMW Concept 4 Series Coupe adds a new dimension to the qualities of the BMW 3 Series Coupe in terms of aesthetics, dynamics and elegance. The “4″ doesn’t just mark the start of a new cycle, it represents the zenith of a development curve. BMW has given the new model its own individual character and a standalone design – and, in so doing, has turned “4″ into segment shorthand for aesthetic and dynamic appeal. The latest addition to a nomenclature that sees BMW building on the fine tradition of its large BMW 6 Series and BMW 8 Series Coupes, the “4″ stands for greater sportiness, greater exclusivity and even clearer differentiation from the BMW 3 Series range. 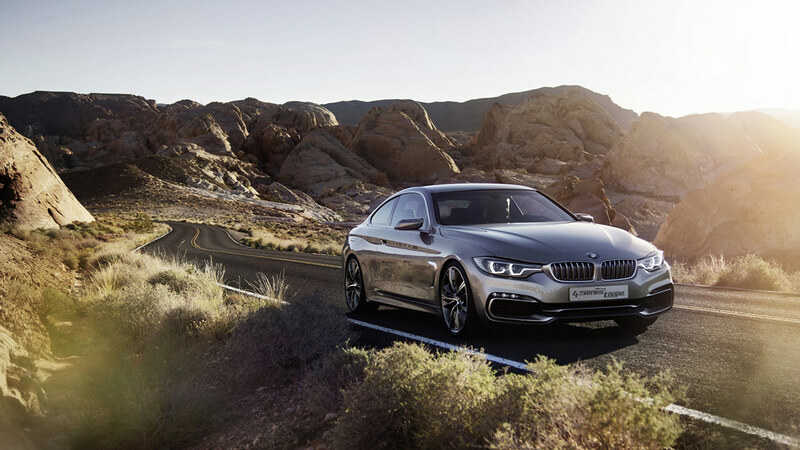 The BMW Concept 4 Series Coupe allows the driver to experience the essence of this new, sporting and elegant generation of car in the lap of contemporary luxury. An array of high-quality details provide an exclusive showcase for the car’s perfectly balanced coupe proportions. Inside, the expertise of BMW Individual, skilled hand craftsmanship and carefully selected materials combine to create a supreme interior. 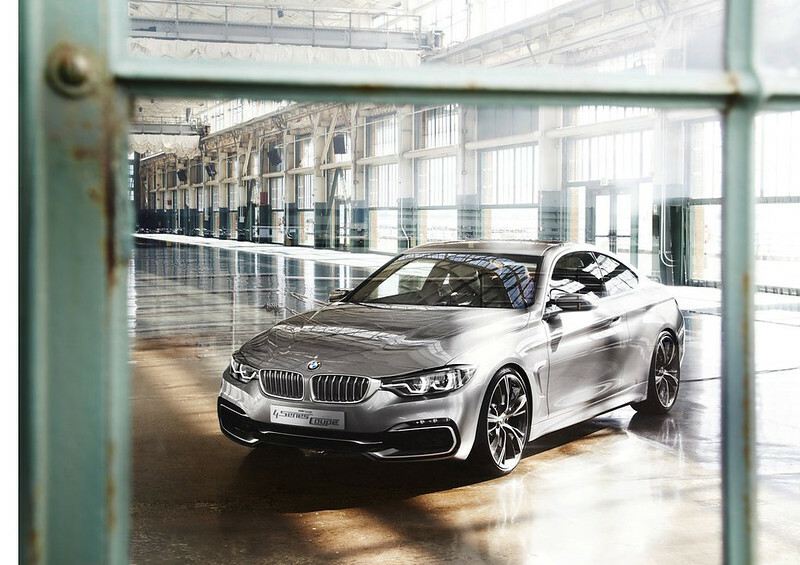 The role of BMW Individual in the BMW Concept 4 Series Coupe’s development clearly underlines the brand’s commitment to challenging itself constantly in pursuit of perfection. A BMW Coupe is surrounded by a halo of fascination, and one glance tells the observer all he needs to know about the driving experience on offer. 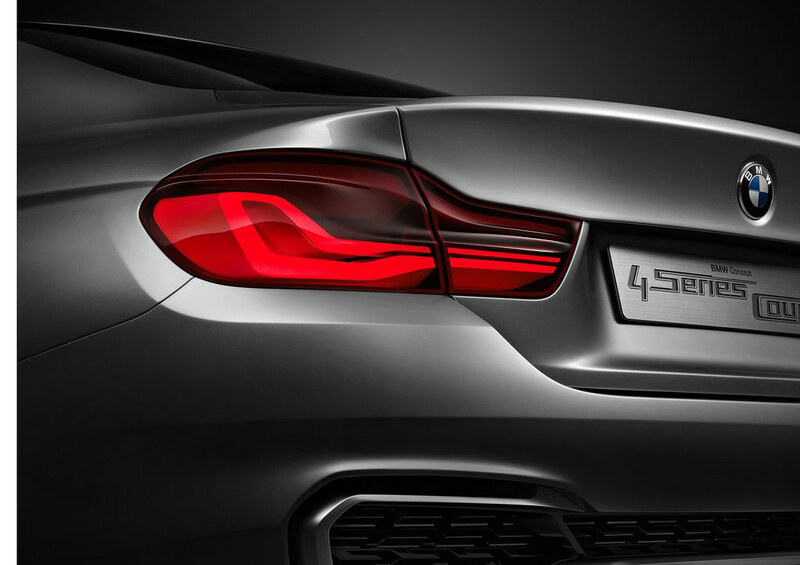 The elegant lines and athletic surface interplay of the BMW Concept 4 Series Coupe embody the qualities and expertise of BMW design and shine out through its sporting silhouette. 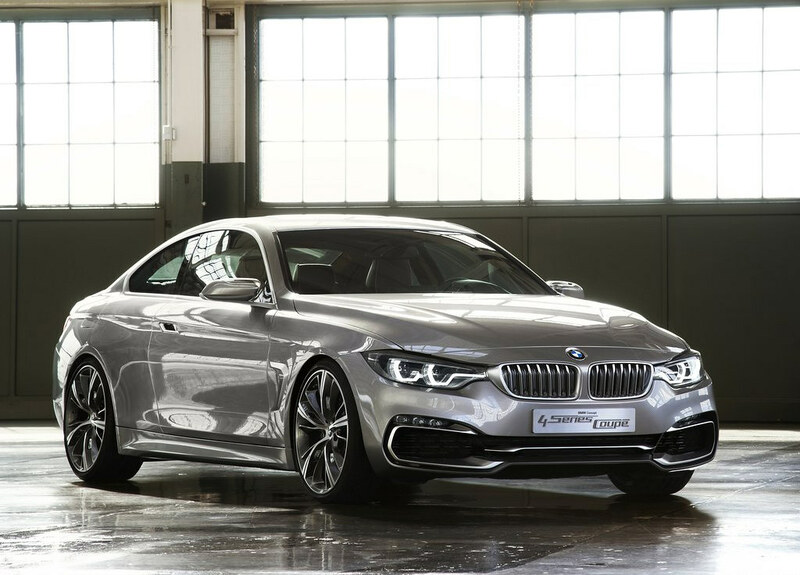 The car’s proportions also fit the familiar BMW template: its long wheelbase, long sweeping bonnet, set-back passenger compartment and short overhangs propel the BMW Concept 4 Series Coupe forwards even before its engine stirs into life. At the same time, its stretched proportions exude a very athletic elegance – the rear wheel arches mark the widest point of the car, emphasizing the point – and taut lines and surfaces etch emotion and precision into the body. 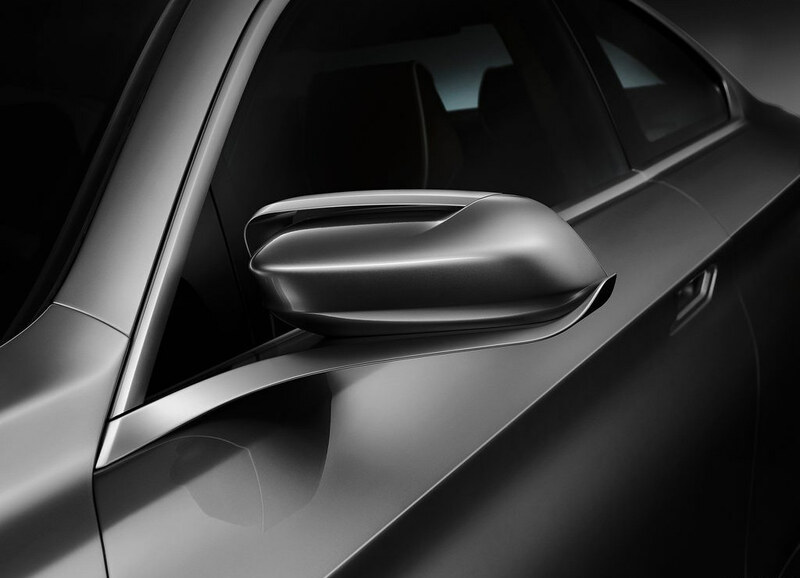 The Coupe’s sophisticated detailing also captures the imagination on closer inspection. Functional elements such as air intakes and vents, door openers and exterior mirrors are given a stylistic lift by classy satin-finish aluminum accents. The exceptional dedication of the designers in achieving the right look for each particular function is evident in every one of these details. 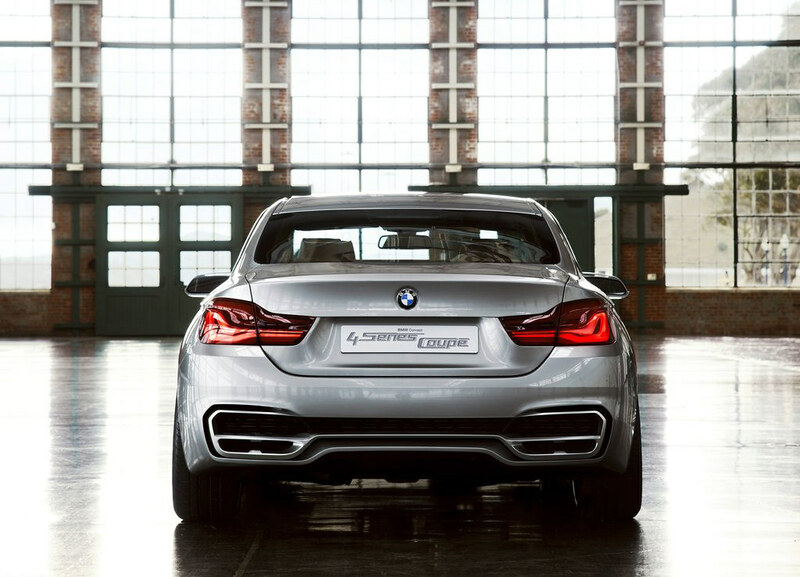 Precise contours and multifaceted surfaces define the striking face of the BMW Concept 4 Series Coupe. 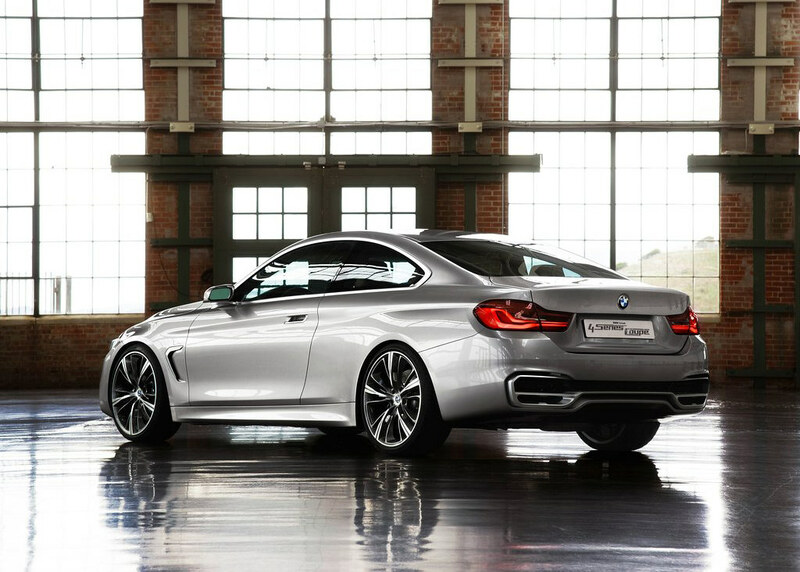 The hallmark BMW front-end features, notably the kidney grille and twin circular headlights, have a slim, sporty design and ensure the BMW Concept 4 Series Coupe is immediately recognizable as a BMW. 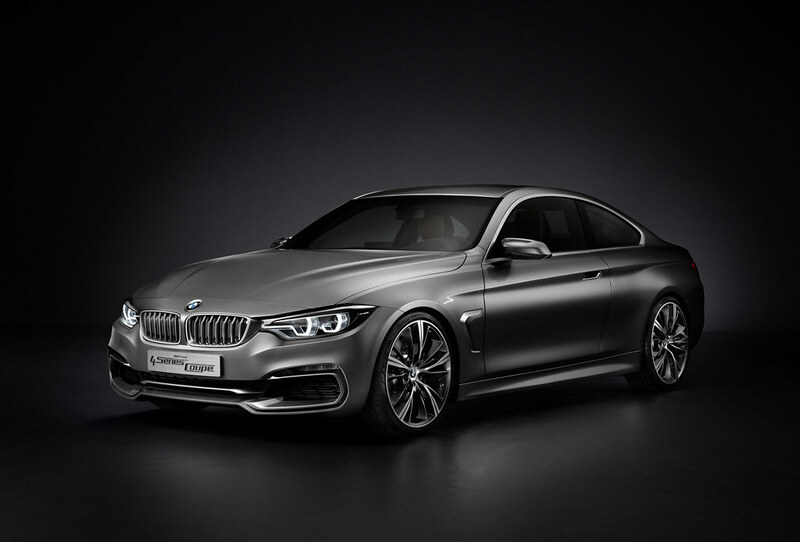 The front-end design displays a clear link with the BMW 3 Series family, but its sporting take on the theme accentuates the dynamic leanings of the BMW Concept 4 Series Coupe. The new concept car lavishes both front-end design icons with meticulous detail and three-dimensional depth. 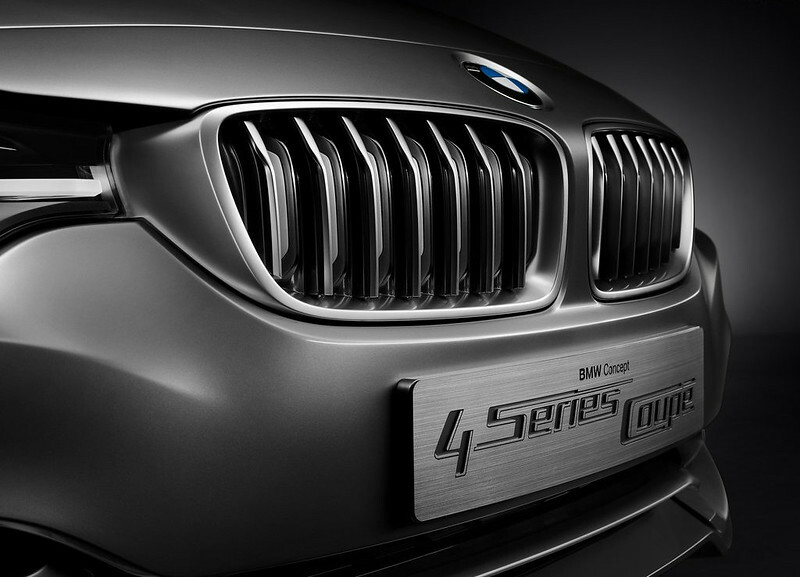 The kidney grille is closed off in the interests of optimizing aerodynamics and keeping fuel consumption low, and the areas between the elaborately designed, satin-finish grille slats are blanked off by dark surfaces. 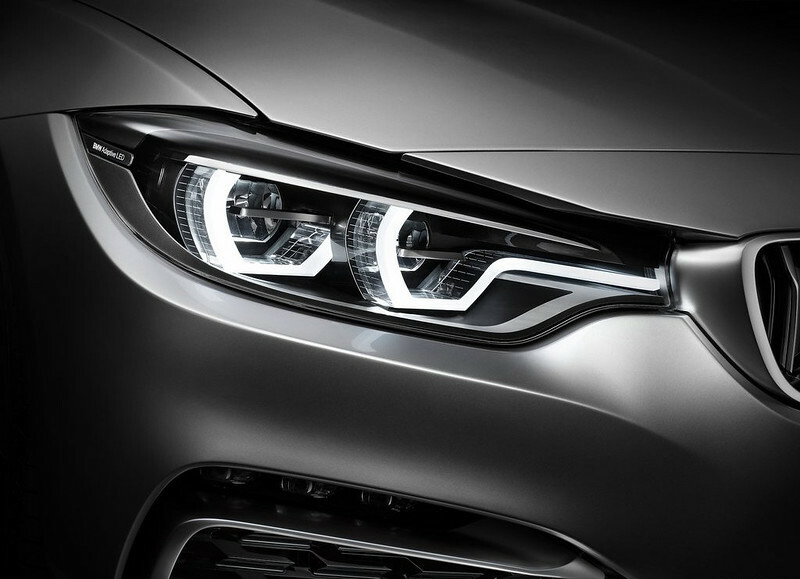 The full-LED headlights are a hexagonal, extremely technical-looking take on the customary BMW twin circular design. The dynamically chiseled, slimmer interpretation of this iconic design cue integrates seamlessly into the front end. 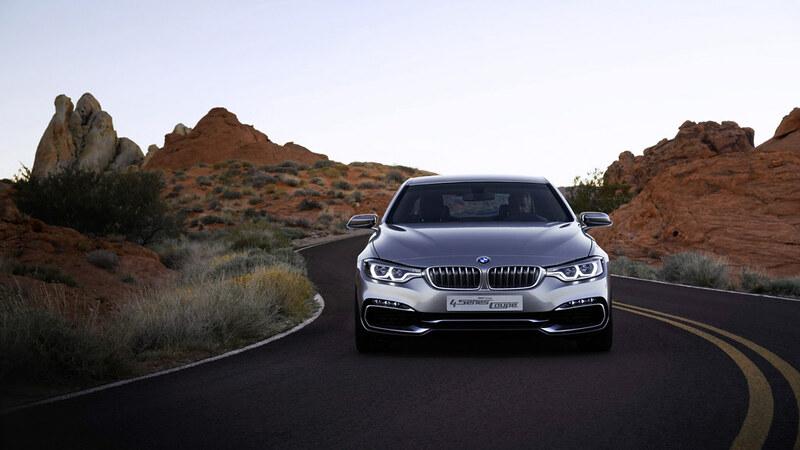 The design of the headlights adopts the link between the lights and kidney grille familiar from the BMW 3 Series and takes it to the next level, rendering this connection visible in darkness as well. An optical fiber leads out from the inner headlight tube and forms a visual link between the inner headlight and the kidney grille. In so doing, it gives the front end of the Coupe an even broader look. The most eye-catching feature of the car’s nose beyond the familiar BMW kidney grille and twin circular headlights is the large air intake in the front apron. Its wide opening hints at the extra air required by the powerful engines and guides the eye around to the muscular flared wheel arches. The two vent surrounds on either side of the intake replicate the contours of the hexagonal headlight graphics to lend the front end an even wider and more sporting look. Three strikingly sculptured, satin-finish aluminum trim elements in the intake provide added presence. Eye-catching and extremely width-accentuating, they give the aperture a sporty three-way split. The sides of the two flanking vents are of differing thickness and lend the front end a particularly dynamic appearance. At the same time, they mark off specific areas of the intake for brake and oil cooling and for the Air Curtain. This Efficient Dynamics feature channels the incoming air around the outside of the wheels, ensuring the airflow “hugs” the wheel arches and fuel consumption is noticeably reduced as a consequence. 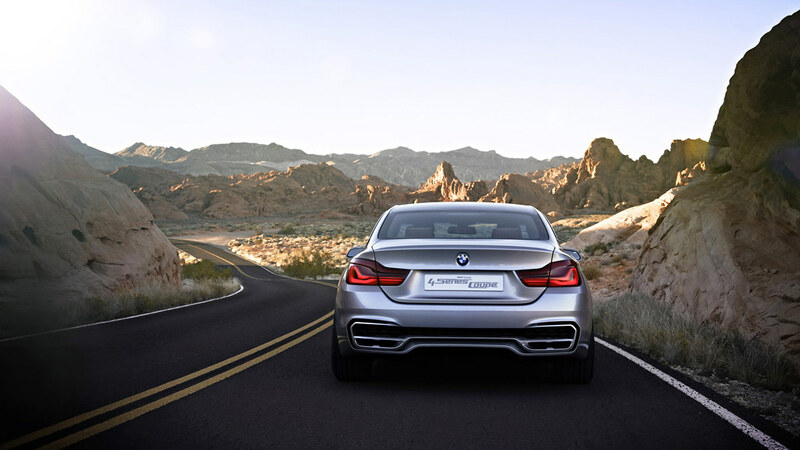 Flowing, typically BMW proportions and a stretched silhouette define the athletically elegant side view of the BMW Concept 4 Series Coupe, with elongated lines and expressively contoured surfaces providing a lively interplay of light and shadow. The gently downward-sloping roofline – a classic coupe feature – creates a smooth transition into the rear, stretches the overall appearance of the car and takes the elegant route to accentuating the sporting appeal of the car’s flanks. The side windows also adhere to the slim and stretched theme. The striking exterior mirrors extend organically out of the shoulder line and provide another example of the eye for detail which allows aerodynamic function to be integrated neatly and with emotional appeal into the car’s form. 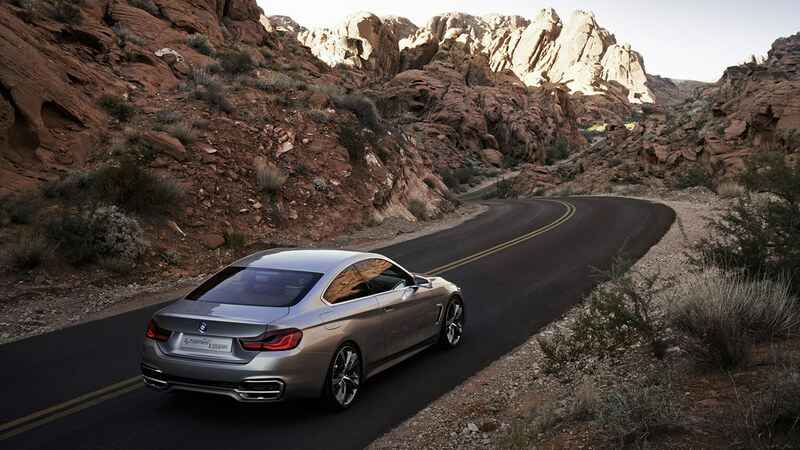 The BMW Concept 4 Series Coupe boasts elegantly molded shoulders, and surfaces and volumes blend harmoniously as the roof slopes down into the rear. The result is a sporty C-pillar design, which merges flawlessly into the sleek silhouette. Below the side windows, the “double swage line” familiar from the BMW 3 Series range lends the car a dynamic sense of forward motion. The shadowed surface above the rear wheel shrinks significantly below the swage line. This accentuates the muscular contours around the rear wheels, emphasizing the car’s dynamic flair and hallmark BMW rear-wheel drive. 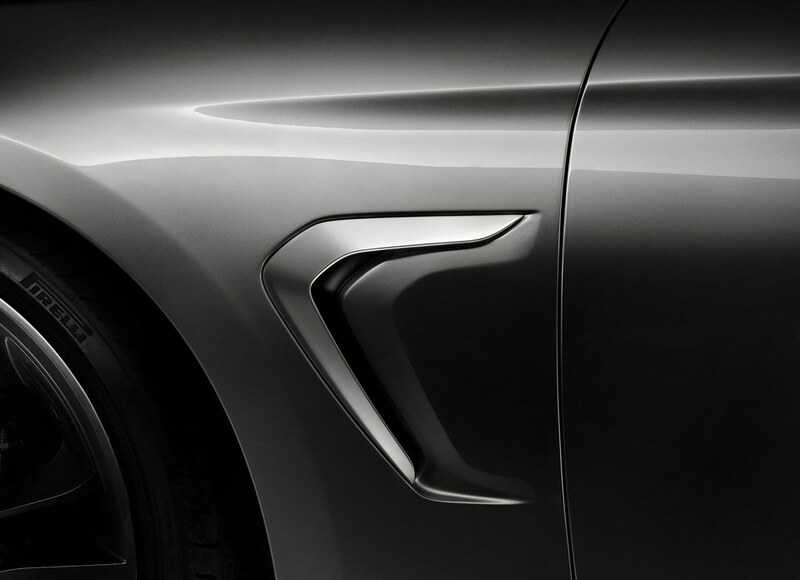 The Air Breather, an aerodynamically effective aperture behind the front wheels, offers another pointer to the sophisticated aerodynamics of the BMW Concept 4 Series Coupe. It draws a dynamic path between the two light surfaces of the car’s flanks, replicating the prominent form of the stylistic front-end elements. The Air Breather brings together the priorities of BMW Efficient Dynamics and time-honoured BMW design, and works in tandem with the Air Curtain in the front apron to ensure an effective reduction in drag around the wheels. Exclusive 20-inch light-alloy wheels add the finishing touches to the car’s dynamically elegant silhouette. Their sophisticated, prominently three-dimensional multi-spoke design underscores their air of sporting elegance. The most striking element of the rear end is the bumper, in which a clearly defined trim element in satin-finish aluminum provides a classy lower edge as the car drops down towards the road. The trim element adopts a similar three- way split to the front air intake, but in a width-emphasizing form. It picks up the two exhaust tailpipes in a dynamic sweep at the outer edges of the rear apron before diverting the gaze to the wheels. Small upturns next to the tailpipes lend additional dynamic flair and finesse. 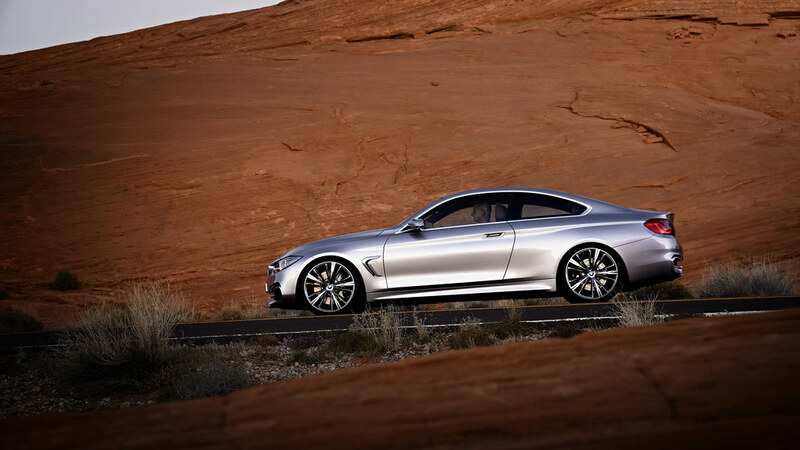 BMW Concept 4 Series Coupe. 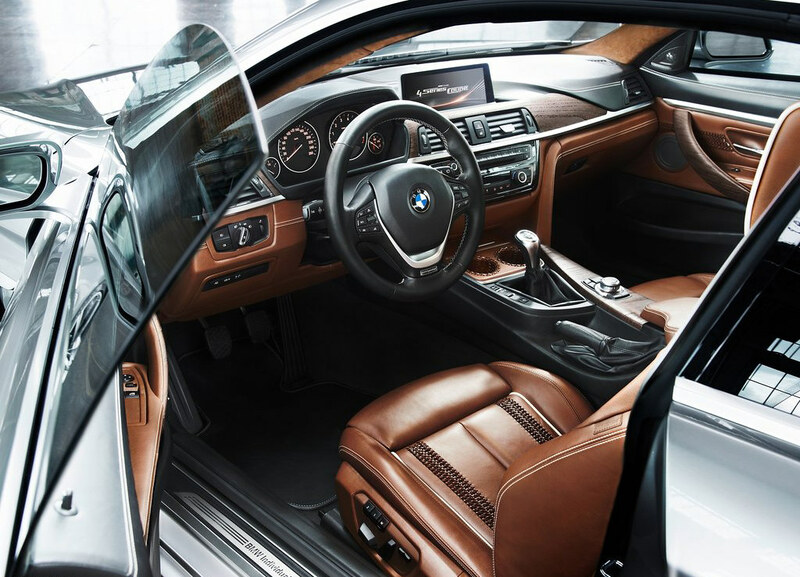 Developed by BMW Individual, the color and materials design of the BMW Concept 4 Series Coupe is tailored precisely to the geometry of the interior. 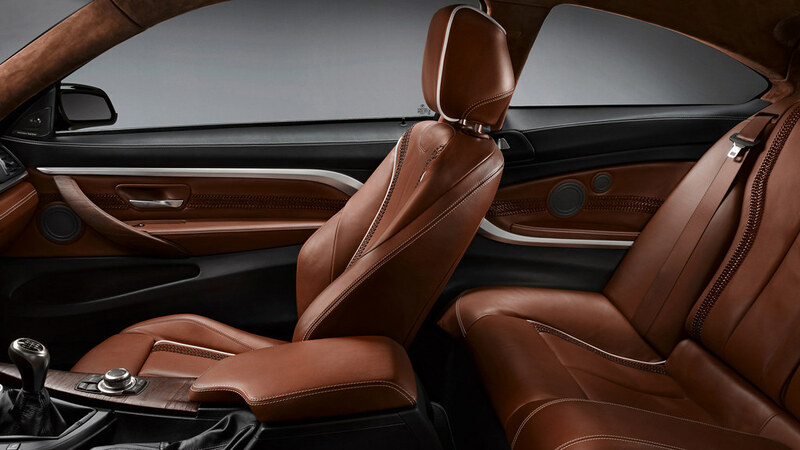 The two-tone Black and Schiaparelli Brown trim provides a particularly effective showcase for the interplay of forms in the front cabin, and light contrast stitching adds a fresh touch to the leather-covered surfaces. 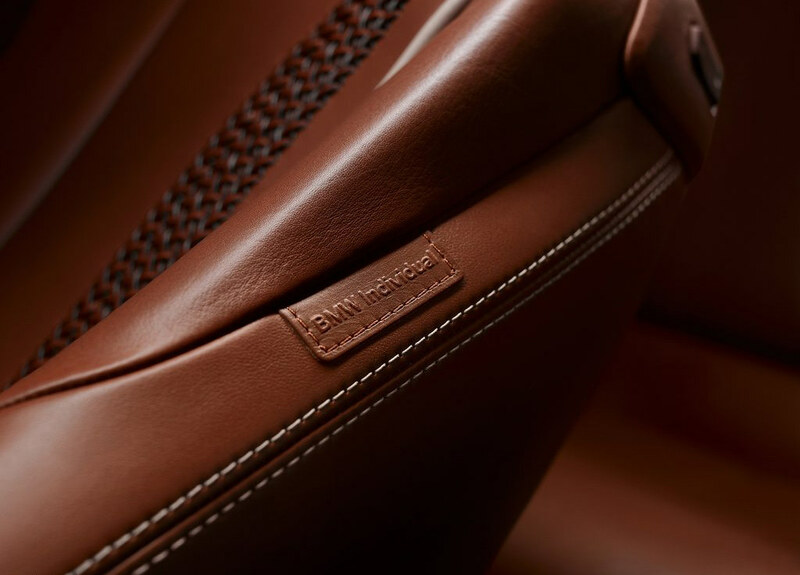 This exclusive trim consists of sustainably tanned leather, which makes a convincing case for itself with its natural feel and soft texture, as well as the environment-friendly tanning process used to produce it. 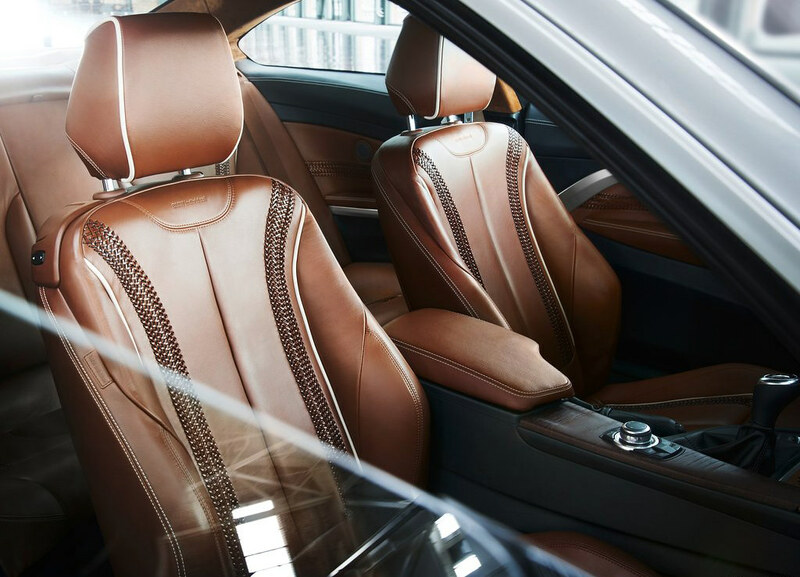 A Natural Chestnut fine wood trim strip adds the finishing touch to the exclusive interior. 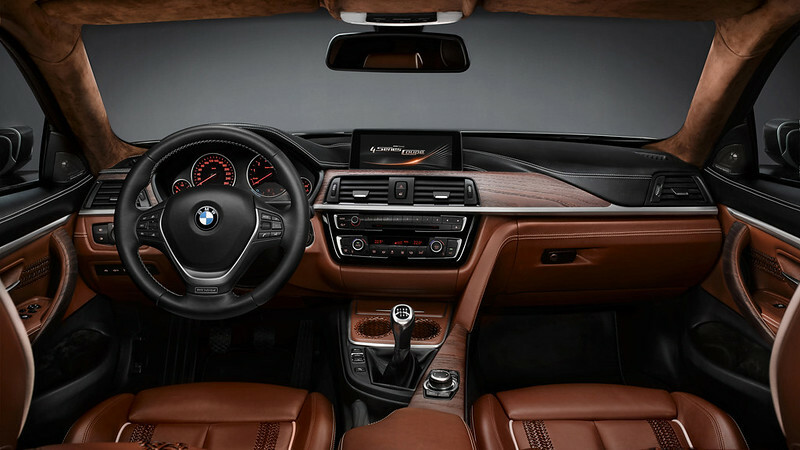 The combination of carefully selected, high-grade materials, sophisticated details and the extensive use of hand craftsmanship fills the BMW Concept 4 Series Coupe with an ambiance defined by contemporary luxury. The Liquid Metal Silver exterior color developed exclusively for the concept car shows off its expressive exterior design to excellent effect and injects an extra dose of energy into the interplay of contours and surfaces.